I’ve declared this the summer of 2013 to be the Summer of Sammo. Throughout these months I’ve been writing about films starring or directed by Sammo Hung, as well as other Hong Kong genre films of the Sammo Hung era. Here’s an index. 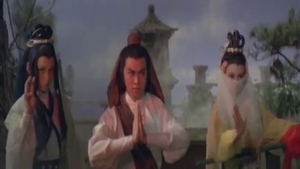 It took me way too long to realize this was an adaptation of the same material as Kung Fu Cult Master (aka Lord of the Wu Tang), a crazy Jet Li wuxia film from 1993 directed by Wong Jing, one that I’ve seen three or four times. The problem is that where Wong’s story is hyperkinetic, cutting faster than the audience can orient itself, the wild shifts in plot creating a dizzying spasm of color and cheap HK special effects, director Chor Yuen manages to make the story reasonably coherent, establishing a variety of distinct and memorable characters amid the swirl. The movies are based on a novel by Louis Cha, a mid to late 20th century author many of whose works have been adapted into films (the Swordsman movies with Jet Li, Wong Kar-wai’s Ashes of Time and The Eagle Shooting Heroes, Chang Cheh’s Brave Archer series). I’ve read only the first part of his The Deer and the Cauldron (adapted into Stephen Chow’s The Royal Tramp movies) and it was a lot of fun. It reminded me of Terry Pratchett, a satirical take on the medieval fantasy world and conventions. But this is apparently unusual for Cha: it was his last novel and was intended “as a satire to his previous work, a reminder to the readers for a reality check”. That quotes comes from Wikipedia quoting Cha’s friend, the screenwriter and novelist Ni Kuang, who made a study of Cha’s work as well as writing many of the great Shaw Brothers films of the 60s and 70s. Heaven Sword and Dragon Sabre is much more serious, at least in Chor Yuen’s version. It still takes place in a comic book fantasy world (the opening credits and narration even play out over a colorful painted scroll) but he treats the material more respectfully than Wong Jing does. That’s not too surprising, given that Wong is responsible for some of the grossest lowest common denominator stunts of 80s and 90s Hong Kong cinema. When in doubt, blame everything on Wong Jing, I always say. The hero, Zhang Wuji, is an orphan, marked for death as a child by a Freezing Palm attack that leaves him marked and sickly. He’s kept alive into young adulthood by a healer living in an isolated woods (the cabin in the woods being an archetypal kung fu location, like the inn, the temple, the palace, etc). Eventually he gets caught up in a massive clan war, as the eight various schools of martial arts (Shaolin, Wu Tang, Er Mei, Ming Cult and so on) are manipulated into warring against each other, and most specifically against the Ming Cult, by a pair of shadowy figures: one a disgraced monk with a connection to the hero’s past, the other a Princess of the ruling Yuan Dynasty (the Yuan were the Mongol rulers of China descended from Genghis Khan, for more about the Chinese revolution against the Yuan, see King Hu’s The Fate of Lee Khan.) It’s unclear in the film whether the Ming Cult is supposed to be related to the Ming Dynasty. Apparently the novel explains that the cult comes from Persia, and is based on Manicheaism, which is why the other clans, all orthodox Buddhists, see it as an ‘evil cult’. The film is split in half. Part One follows Zhang from childhood through his accidentally healing himself and learning some advanced martial arts (he has a knack for stumbling across hidden treasures) to his assuming the leadership of the Ming Cult after rescuing its masters from attack by the other clans. The second half follows his attempts to unify the clans to oppose the Yuan and the evil monk, as well as rescue his godfather, a blind recluse who knows the whereabouts of the famed Dragon Sabre, which the bad guys want to get because it contains a hidden secret. The prime movers of the plot are almost all women, and Zhang has complicated love/hate relationships with at least four major female characters. The reversals of the plot are too dizzying to relate quickly, but at least Zhang doesn’t seem able to keep up with the plot either. Like Heroes Shed No Tears, Chor Yuen’s wuxia world is bright and colorful, with the objects like flowers and tree branches creating frames within the frame, and fog machines liberally sprinkled around the sets. He’s patient with the exposition, allowing the dialogue to play out in long talky scenes in the same way he films the action. It’s about movement in space: the shifts of the actors as they fight and the story as the plot twists itself up then slowly unravels. It doesn’t have the psychological nuance of The Sentimental Swordsman or Intimate Confessions of a Chinese Courtesan, nor the tightness and inevitability of the scenario in Heroes Shed No Tears. It’s a gorgeous storybook world he builds, one of endless adventure and possibility.